A chimney cleaning is recommended annually for your New York home to remove debris and dirt that accumulates naturally from weather deterioration and from animal nests in the chimney flue. Regular chimney maintenance and cleaning will also help improve heating efficiency and safety to your home. The slightest amount of soot accumulation in a chimney is enough to cause a chimney fire which can damage the chimney and spread into a home causing more serious problems. Call 1-877-952-7425 to schedule chimney cleaning service or request a Free Chimney Cleaning Quote. 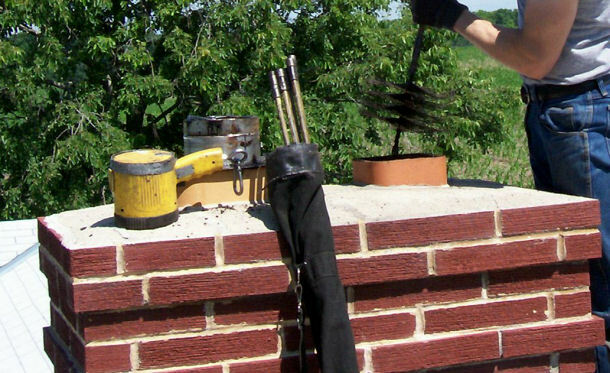 At Chimney Repair NY, we have been maintaining and cleaning chimneys for over 20 years throughout Brooklyn, Manhattan, Long Island, Queens, Westchester, and Bronx, New York. We are committed to providing clients with the highest level of quality service and guarantee every job is done properly. New York safety guidelines recommend annual chimney cleaning and inspection to ensure your home is safe and protected from dangerous problems like chimney fires and gas leaks. We are the best at removing the dirt and debris that has accumulated in your chimney and fireplace with NO mess to your home and guarantee customer satisfaction. For reliable, simple, and affordable service call Chimney Repair NY 1-877-952-7425, the chimney cleaning professionals you can trust or request a Free Chimney Cleaning Quote.